CBI - China: Day 80 of 154 of the Japanese Invasion of Manchuria. Spain: Day 143 of 985 of the Spanish Civil War. Spain: Day 508 of 985 of the Spanish Civil War. CBI - China: Day 153 of 2,987 of the 2nd Sino-Japanese War. Europe: A Franco-German friendship pact is signed. Spain: Day 873 of 985 of the Spanish Civil War. CBI - China: Day 518 of 2,987 of the 2nd Sino-Japanese War. Day 56 of 81 of Japan's Operation GUANGDONG. Atlantic: Germany warns neutral ships to resist the British blockade. Finland: Day 7 of 105 of the Russo-Finnish War. The Soviet attacks against the Mannerheim line are beaten back with the Soviets suffering very heavy casualties. CBI - China: Day 883 of 2,987 of the 2nd Sino-Japanese War. Day 22 of 381 of the Battle of South Guangxi. ETO - UK: Day 92 of 258 of the Blitz. ETO - France: The "War Guilt" trial in Vichy France (to lay blame for events leading up to France's entry into the war) indicts MM Blum, Daladier, La Chambre and General Gamelin. MTO - Albania: The Greeks occupy Santi Quaranta. Italian Supreme Commander Badoglio resigns at his own request and is replaced by General Cavallero. East Africa: Day 180 of 537 of Italy's East African campaign in the lands south of Egypt. CBI - China: Day 1,249 of 2,987 of the 2nd Sino-Japanese War. CBI - Thailand: Day 67 of 221 of the Franco-Thai War (Vichy France vs Thailand). USA: Peaking at 800,000 members in 650 chapters, the anti-war America First Committee (AFC), headed by Charles Lindbergh, is at its zenith. Tomorrow interest will plummet and in 5 days the organization will be disbanded. 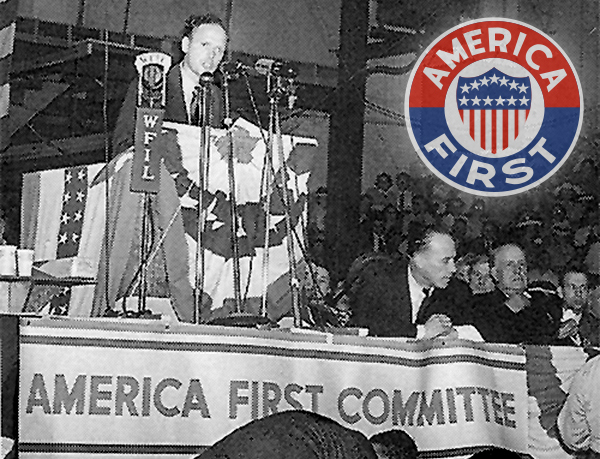 The America First Committee was established on September 4, 1940, by Yale Law School student R Douglas Stuart Jr, along with other students, including future President Gerald Ford, future Peace Corps director Sargent Shriver, and future US Supreme Court justice Potter Stewart. 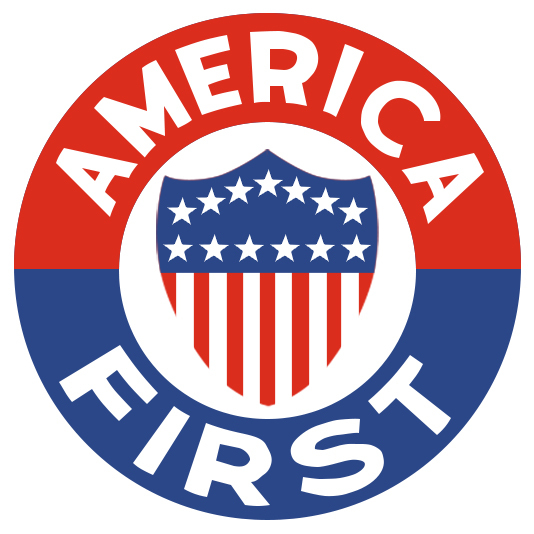 At its peak, America First claimed 800,000 dues-paying members in 650 chapters, located mostly in a 300-mile radius of Chicago. 1) The United States must build an impregnable defense for America. 2) No foreign power, nor group of powers, can successfully attack a prepared America. 3) American democracy can be preserved only by keeping out of the European war. 4) "Aid short of war" weakens national defense at home and threatens to involve America in war abroad. USA: President Roosevelt sends a last minute plea to the Japanese Emperor for peace. Russian Front - North: Day 90 of 872 of the Siege of Leningrad. Russian Front - Center: Day 66 of 98 of the Battle of Moscow. Soviet Army launches a major counter-offensive around Moscow. Russian Front - South: Day 38 of 248 of the Siege of Sevastopol, Crimean Peninsula. MTO - Libya: Day 241 of 256 of the Siege of Tobruk. CBI - China: Day 1,614 of 2,987 of the 2nd Sino-Japanese War. CBI - Thailand: The RAF spots Japanese transports sailing west off Cape Cambodia toward Malaya. The British have a counter-plan but do not use it for fear of violating Thai neutrality. ETO - France: US 8th Air Force heavy bombers attack targets at Abbeville and Lille. Russian Front - North: Day 455 of 872 of the Siege of Leningrad. Russian Front - North: Day 18 of 59 of the Battle of Velikiye Luki, near Leningrad. This stalemate does help ease the siege a little, but mostly it keeps German troops from being sent to other fronts. Russian Front - North: Day 216 of 658 of the Siege of the Kholm Pocket, USSR lays siege to the Kholm Pocket but the Germans hold out for a about a year and a half. Russian Front - Center: Day 13 of 21 of the Battle of Sychevka, Russia. Russian Front - Center: Day 12 of 26 of the 2nd Battle of Rzhev-Sychevka, Russia, launched by the Soviets as Operation MARS. Russian Front - Center: Day 12 of 22 of the Battle of Belyi, Russia. Russian Front - Center: Day 12 of 17 of the Battle of Luchesa (Vitebsk), Russia. Russian Front - Center: Day 12 of 29 of the Battle of Molodoi Tud River, Russia. Russian Front - South: Day 107 of 165 of the Battle of Stalingrad, bloodiest battle in human history. MTO - Tunisia: Day 20 of 178 of the Battle of Tunisia. German troops penetrate positions of the US 1st Armored Division on the El Guettar Mountains. US 12th Air Force provides air support. MTO - Libya: US 9th Air Force B-24s bomb Misurata and two enemy airfields. CBI - China: Day 1,979 of 2,987 of the 2nd Sino-Japanese War. PTO - Alaska: Day 183 of 435 of the Battle of Kiska, Aleutian Islands. PTO - Malaya: Day 291 of 357 of the Battle of Timor Island, a long guerrilla war ending in Japanese victory. PTO - New Guinea: Day 18 of 66 of the Battle of Buna-Gona. PTO - Solomon Islands: Day 122 of 187 of the Battle of Guadalcanal. Russian Front - North: Day 820 of 872 of the Siege of Leningrad. Russian Front - North: Day 581 of 658 of the Siege of the Kholm Pocket. USSR lays siege to the Kholm Pocket but the Germans hold out for a about a year and a half. Russian Front - South: Day 105 of 122 of the Battle of the Lower Dnieper River, USSR. MTO - Greece: US 15th Air Force B-24s bomb Eleusis Airfield while B-17s hit Kalamaki Airfield. MTO - Italy: Monte Carnino is finally taken by US 5th Army. US 12th Air Force provides air support. CBI - China: Day 2,344 of 2,987 of the 2nd Sino-Japanese War. Day 35 of 49 of the Battle of West Changde. PTO - New Guinea: Day 79 of 219 of the Battle of Shaggy Ridge. PTO - New Guinea: Day 76 of 162 of the Battle of the Huon Peninsula. PTO - Solomon Islands: Day 36 of 295 of the Battle of the Bougainville Islands. ETO - France: Day 128 of 284 of the Battle of Brittany. ETO - France: Day 83 of 236 of the Siege of Dunkirk. ETO - Germany: Day 79 of 145 of the Battle of Hürtgen Forest. ETO - Germany: US 8th Air Force heavy bombers hit rail targets in Germany, the 384th Bomb Group hits the oil refinery at Leuna. Russian Front - Finland: Day 83 of 223 of the Lapland War. Finland and Russia have joined forces to kick the Germans out of Finland's most northern province. Russian Front - Center: Day 53 of 206 of the Battle of the Courland Pocket in Latvia. Russian Front - Center: Day 46 of 99 of the Siege of Memel, a border town of Lithuania and East Prussia. Russian Front - South: Day 39 of 108 of the Battle of Budapest, Hungary. MTO: US 15th Air Force B-17s and B-24s attack targets in Austria, Hungary, Yugoslavia and Czechoslovakia. CBI - Burma: Day 250 of 302 of the Chinese Salween Offensive. CBI - Burma: Day 23 of 31 of the Battle of Bhamo. CBI - China: Day 2,710 of 2,987 of the 2nd Sino-Japanese War. Day 234 of 259 of Japan's Operation ICHI-GO.The Japanese capture Tushan, south of the nationalist capital of Chungking. PTO - New Guinea: Day 345 of 597 of the Battle of New Britain. PTO - New Guinea: Day 229 of 481 of the Battle of Western New Guinea. PTO - Philippines: Day 48 of 299 of the 2nd Battle of the Philippines, aka the Liberation of the Philippines or the Philippines Campaign. PTO - Philippines: Day 48 of 73 of the Battle of Leyte. PTO - Philippines: Day 26 of 41 of the Naval Battle of Ormoc Bay.